Creatine plays an important role in the production of cellular energy by making ATP, a molecule needed by all cells in the body. Creatine, an organic acid naturally produced in the body from other amino acids, is found in foods such as meats, eggs, and fish. With increases in exercise or as a result of muscle damage, the physiological need for creatine is increased. Creatine supplementation has been shown to support increased work capacity and power output of the muscle while promoting physical endurance and lean body mass gains. Outside of the athletic population, creatine has also been shown to lessen muscle breakdown and support cognitive function in aging populations. We use Creapure®, a micronized form of creatine monohydrate that’s colorless and odorless. 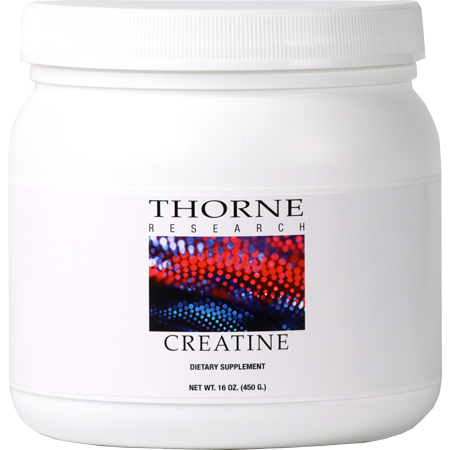 Our Creatine has enhanced solubility so it mixes well with juice or other Thorne Research products to meet your performance goals. Creatine is NSF Certified for Sport®.